While it feels like summer is over as school is already in session in some parts of the country, like here in Atlanta, there are still a few weeks left of summer vacation for other parts of the country. I had intended to post this a while back, but well, life got in the way and here I am posting it now, halfway through August! However, with school starting up and hectic schedules ensuing with after school activities, many of the same principles can still apply to get quick meals on the table with minimal effort. Back in June we went on vacation to the beach for a week. 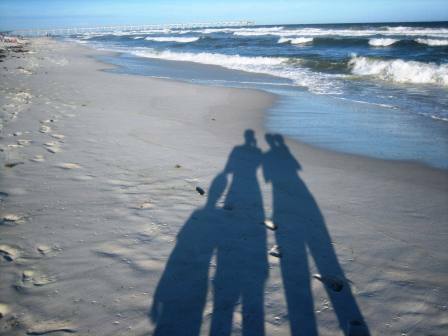 It was our first family vacation in a long time and it was wonderful. I always prefer to stay in a condominium so that I have access to a kitchen. It is always fun to eat out and experience local cuisine wherever I am, but I also enjoy being able to prepare some of my own meals. Of course, you never know what you are going to end up with in terms of kitchen utensils and equipment. If we are driving, I do like to pack along a few essentials like a good chef’s knife and cutting board. Also, I like to bring some basic spices along as well rather than having to buy a bunch of new ones. Occasionally I’ve stayed in a condo that had some spices available, but it is rare. The other thing about cooking while on vacation is that I don’t want to spend a lot of time in the kitchen cooking or cleaning. I want to relax and enjoy. The same is also true right now as school is back in session and t-ball is starting up for my son. I need quick, fast dinners. So with that in mind, I came up with 2 meals that fed us well with leftovers for lunch the next day! The first was sautéed pork chops, sweet potatoes and green beans (sorry, no pic of this – I will have to recreate one of these days and update!). The only real cooking I did was with the pork chops. I simply seasoned with a little bit of salt and pepper on both sides. I heated a pan with canola oil and then cooked the pork chops a few minutes on each side until cooked through. Thin ones cook in less than 10 minutes. In the produce section, I found bags of sweet potatoes that are triple washed and can actually be steamed in the bag. The green beans were frozen in a steamable bag as well. So while the pork chops cooked, I microwaved the sweet potatoes and then the green beans. Dinner was ready in less than 15 minutes with minimal effort on my part and only one pan to clean. Can’t beat that! Another meal that was a family favorite was this Ravioli Zucchini Casserole. It is a cinch to throw together and then bake off while playing with the kids. It is also something you could easily assemble earlier in the day and then refrigerate until cooking time. I need to make this again soon for the crazy weeks ahead! This easy throw together casserole can be assembled ahead of time or in minutes before baking off for a quick dinner. Preheat oven to 375 degrees F. Spray a 9x13 cooking pan with cooking spray. Spread half of the ravioli on the bottom of the pan. Cover with half of the zucchini slices, half of the spaghetti sauce, and 1 cup of mozzarella cheese. 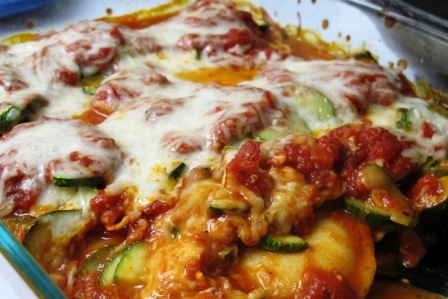 Repeat the layers with the remaining ravioli, zucchini, spaghetti sauce and mozzarella cheese. Cover with aluminum foil and bake for about 25 minutes. Uncover and bake an additional 5-10 minutes or until heated through and cheese is melted. What are your favorite vacation meals or quick, throw together dinners? And if you need some ideas for staying fit while on vacation, check out my 5 Tips in this post.